Heat oven to 350°F (325°F for dark or nonstick pan). Spray bottom only of 13x9-inch pan with baking spray with flour. In small bowl, mix hot water and gelatin until gelatin is completely dissolved; cool slightly. 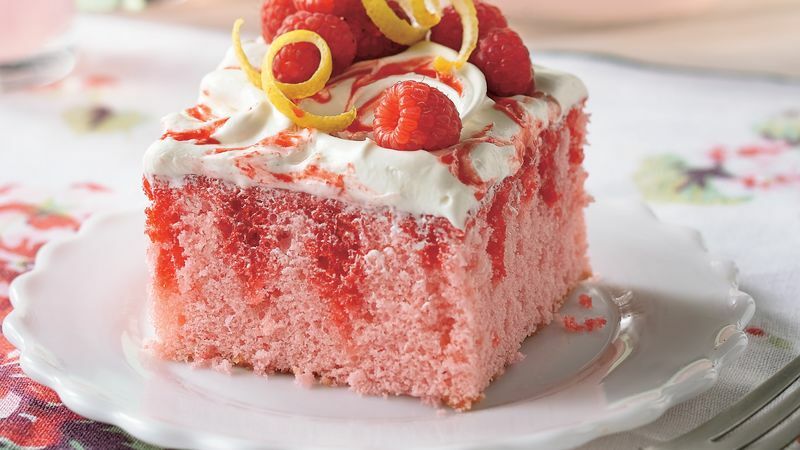 In large bowl, beat cake mix, 1/4 cup of the gelatin mixture, 1/4 cup of the lemonade concentrate, the water, oil and egg whites with electric mixer on low speed 30 seconds, then on medium speed 2 minutes. Pour into pan. Reserve remaining gelatin mixture and lemonade concentrate. Bake 25 to 31 minutes or until toothpick inserted in centre comes out clean. Poke warm cake every inch with fork tines. Remove 1 tablespoon of the reserved gelatin mixture to microwavable custard cup or small bowl. In another small bowl, mix remaining gelatin mixture and remaining 1/4 cup lemonade concentrate; pour slowly over cake. Cool completely, about 1 hour. In medium bowl, fold together frosting and whipped topping; frost cake. Microwave 1 tablespoon gelatin mixture uncovered on High 10 seconds to liquefy. Using 1/4 teaspoon measuring spoon, place small drops of gelatin mixture over frosting; with spoon or toothpick, swirl gelatin into frosting. Garnish each piece with raspberries and lemon peel strips. Store covered in refrigerator. For a shower dessert, garnish each piece with a small paper beverage umbrella. If you plan to tote this cake, be sure to use an insulated cooler to keep it cold.